I’m a bit of a movie fanatic. 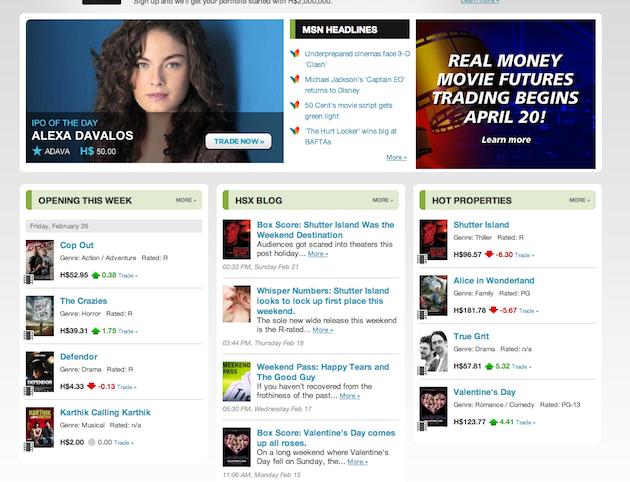 As such, back in the day one of my favorite websites was Hollywood Stock Exchange (HSX). On it, you bought and sold both movies (moviestocks) and movie stars (starbonds) based on how you thought they would do with upcoming releases. Of course, all of this was done with virtual cash (H bucks), making it a fun game. But in April, the game turns real. As in, real money. On April 20, HSX will become a real-money commodity exchange, according to The Hollywood Reporter. As such, they’ve had to file with the U.S. Commodity Futures Trading Commission for approval, which they did in November, and are now in the final phase of approval, apparently. Yes, this is actually happening. And yes, this will essentially make HSX a real-world betting site. Once launched, a new HSX site will list current and imminent movie releases with their projected four-week domestic grosses and allow exchange users to take long or short positions on the films. Investors wishing to participate in the exchange will buy “contracts” priced at one one-millionth of a film’s projected boxoffice, with films to be listed on the exchange from the time productions are announced in the industry trade papers. Trading will begin six months before a movie’s anticipated wide release. And while the target audience is film fanatics, they’re also targeting Hollywood industry types, though warns that anyone doing any kind of insider trading is subject to prosecution just as with any other market. Everyone starts with 10,000 “virtual dollars” in a Cantor Exchange practice account, and at the end of the practice period Cantor Exchange will convert each 1,000 virtual dollars of profit you earn into $10 cash and deposit it into your real-money trading account (maximum $100 per trader). So if you earn 10,000 virtual dollars in profit while practicing on Cantor Exchange, you get $100! There is no cost to participate in this program. This should be interesting, to say the least. This is certainly one way for a website to make money.